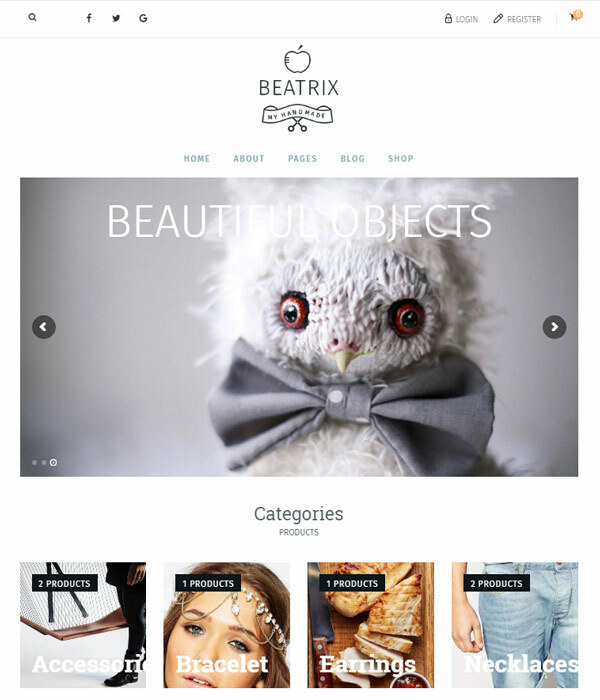 Although Beatrix is a great choice for anyone selling hand made items, you can obviously use this theme just as effectively for many other niches. Clothing and jewellery would be other examples of products suited to the Beatrix theme. Beatrix has a clean, minimal design which lets the products stand out and it is easy to use and conventional. Following conventions tends to be a very good idea with e-commerce themes because it should make it easier for visitors to purchase from you. The shop pages themselves work very well and have plenty of nice features like the top rated products widget and the price filter slider. You’ll get a bunch of great features packed in to the Beatrix theme including the Visual Composer page builder, Revolution Slider and a theme options panel for changing all kinds of different elements. You’ll also be in safe hands with TeslaThemes in case you have any issues. These guys have been around for a long time and have thousands of customers from all over the world. Check out the Beatrix theme today to see what you think.